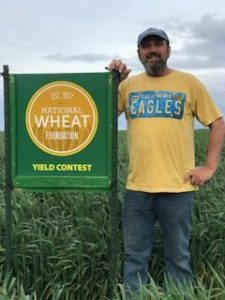 Brian Cochrane, from Kahlotus, Wash., is a 2018 national winner, finishing fourth in winter wheat dryland! He created this sign previously to show his support for the contest. Other Washington state winners were Keith Gross of Adams County who placed second in irrigated spring wheat; Jason Beechinor of Walla Walla County who placed fifth in dryland spring wheat; David Gross of Spokane County who placed fifth in irrigated winter wheat; and Brian Cochrane of Franklin County who placed fourth in dryland winter wheat. Visit the National Wheat Foundation website to see the other winners.